Never doubt Amazon’s prowess when it comes to innovation. This is the company that turned an online book store into one of the largest companies in the world in a decade, and now sells everything under the sun at cheaper prices than outlet stores. But sometimes the company’s ‘innovation’ can be a little… divisive. Take, for example, Amazon Key, a new high-tech package delivery system that's being rolled out in the US, which allows mail couriers to enter your home to drop off deliveries rather than leaving them on the porch where strangers can snag them before you ever get home. In order to achieve this level of white-glove service, Amazon has to take a few liberties with your personal space. You’ll need to install Amazon’s Cloud Cam near your door, and sync your smart home up with an Amazon Key-compatible smart lock. Amazon can then grant its delivery drivers access to your home remotely, and send you a live feed of the delivery as it’s happening. If you can get over the idea of an Amazon delivery person temporarily stepping into your home, Amazon Key promises to be the bane of the front porch package thieves, and good news for the rest of us. So how much is Amazon’s futuristic delivery service going to cost you? Once you buy all the components, absolutely nothing. But buying those components – the Amazon Cloud Cam and Amazon Key-compatible smart lock – could be a bit pricey. 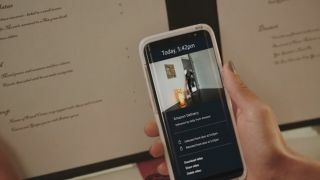 Right now, Amazon is offering Amazon Prime subscribers a deal that for $249 gives you a smart lock, a connected camera and free installation. Should you already own a smart lock from Yale or Qwikset, you can buy a Amazon Cloud Cam separately for $120. The Amazon Cloud Cam is available to pre-order today, and should ship by the time Amazon’s in-home delivery system gets up and running on November 8. How do I get Amazon Key delivery? For starters, you'll need to be an Amazon Prime subscriber, as Amazon is only opening this up to its most loyal fanbase first. If you're not already an Amazon Prime subscriber, you can sign up via this link. Here’s the cool part: Once you've signed up for Amazon Prime and your system is up and running with camera installed and lock on the door, Amazon will enable a Key delivery option automatically at checkout. But before you get any big ideas of ordering a washer from Amazon to watch in horrifying glee as a delivery as a delivery person struggles to carry it up the two flights of stairs to your apartment, there are two major caveats. The first is that Amazon will only allow Amazon Key delivery for around 10 million goods on the website - and only on stuff that a delivery person could reasonably carry by themselves. Which means for now, appliances and large electronics are not included in the service. The other caveat is that while Amazon is an innovator, it’s not an idiot - Amazon is only enabling Amazon Key deliveries for its own drivers. That means it won’t open this service to UPS, FedEx or even the USPS - at least for now. While that may help you sleep easier at night knowing it’s only Amazon who has a key to your home, it’s also problematic for anyone living outside of the 37 cities where Amazon actually handles its own deliveries. Live outside of those 37 US cities and it could be awhile before you get access to Amazon Key. Of course, Amazon wasn't just thinking about deliveries when it designed the Amazon Key system: it will soon be available to professional services as well. What that means is, say, you want to schedule a dog walker but can't be there to let him or her into the house every day. You could use your Amazon Key setup to grand that person access to your home for short periods of time. If you're not a pet owner, it's OK - Amazon is planning on opening up the service to the 1,200 companies that are part of Amazon's Home Services program. That list includes maid services, pet sitters, repair people and more. Like any other smart lock, you can also send key codes to friends and family members, too, allowing them to come and go from the house without you being there to let them in or see them out. Pretty nifty! So how exactly will the system work? As mentioned, once your system is setup you’ll be able to check Amazon Key delivery at checkout. A driver will come to your place as per usual, but instead of leaving the package on your doorstep, the delivery driver can scan the barcode on the side of the package to match it up to your order number. Should everything come back OK, your smart lock will click open and the camera inside the house will turn on and start recording the drop-off. You’ll get a notification on your phone that a delivery is being made, and Amazon will store a copy of the video for 24 hours so you can view it later. The delivery person will place the package close to the entryway of the home and once the delivery is complete, the smart lock will relock as the delivery person exits your home. Now, it's worth pointing out that Amazon Key isn't compatible with other security systems you already have in your home. So, if you have an alarm in the house that needs to be disarmed when someone enters the house, you'll need to turn that off on the day the delivery is slated to happen. The system seems pretty safe, right? For all intents and purposes it is. And yet in a world full of stolen credit card information and password leaks, it can be scary to put the literal keys to your front door in the hands of a big company. And this is Amazon’s biggest obstacle in widespread adoption to Key - people just aren’t all that trusting of big companies at the moment. To play devil's advocate, the idea is relatively well thought-out. The ability to unlock your door is only being granted to Amazon delivery drivers, and only if they are currently carrying a package that’s slated for delivery to your house that day. If they come later with a different package, there’s no way to get in. Then there’s the camera to consider. Any time someone does use the app, the camera will start up and start recording - sending you a real-time feed of the delivery in progress. There’s no Amazon password information being exchanged between you and the driver, and the door lock ensures that no one else will be able to get in after the driver leaves. There are scenarios to consider where someone steals something in your home or a driver doesn’t close your door all the way and the lock doesn’t engage properly, but in the end we’re nearly certain that Amazon Key has to be a better system than leaving a package on your doorstep in broad daylight. While this service has been unveiled for the US, there's no official word on when it will arrive in other regions, if at all, so Australia and the UK shouldn't hold their breath.